Guido Burgstaller (r.) and Alessandro Schöpf have developed a unique understanding with one another for Schalke. Schalke fans had plenty to celebrate on Matchday 31. The 4-1 win over Bayer Leverkusen saw the Royal Blues smash through the mythical 40-point barrier most Bundesliga followers see as the tally required to end relegation worries, and also meant they could start looking up the table again - however slim their chances of UEFA Europa League qualification may be. Click here to add Schöpf and Burgstaller to your #BLFantasy team! 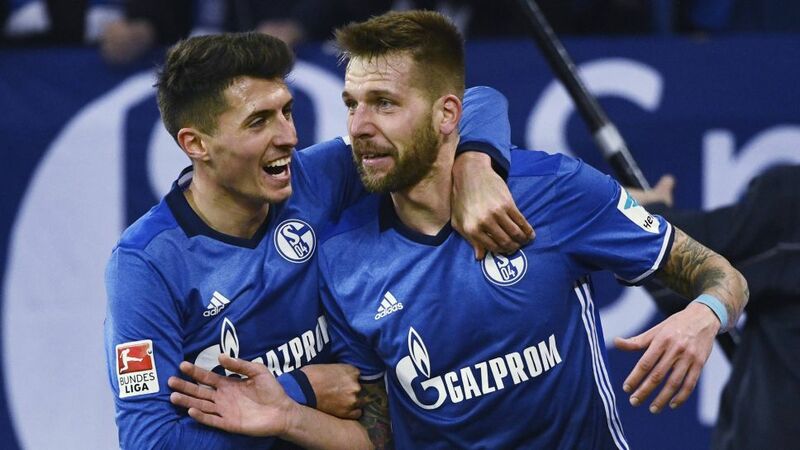 At the heart of Schalke's crushing victory was a pair of south-of-the-border imports: Guido Burgstaller and Alessandro Schöpf. The big striker Burgstaller scored the opener; Schöpf, a willowy winger, set up the second and scored the third; the two linked up for Schalke's fourth. In total, the pair have combined for 14 goals and five assists so far this season. Burgstaller leads the way with eight goals - all scored since he arrived from Nürnberg during the winter break - and his eye for goal has left quite the impression on his teammates. "Sometimes Guido doesn't even know himself how he manages to do what he does," says Leon Goretzka. "He works so hard for the team. We're all excited that it's paying off in goals." The top brass at Schalke share Goretzka's enthusiasm for striker a who celebrated his 28th birthday on Saturday. "He deserves to be singled out," explained Royal Blues sporting director Christian Heidel. "If you count the goals he scored in Bundesliga and the second division together, he'd be hot on the heels of Pierre-Emerick Aubameyang, Anthony Modeste and Robert Lewandowski. You can't say he wouldn't have scored all those goals for us had be been with us at the start of the season." Burgstaller himself seems unfazed by the attention. "I really didn't know that I was going to come in and score all these goals in the Rückrunde," he admitted. "I'm not doing much different to what I was in Nürnberg, but you learn every time you play in the Bundesliga. When you train with good players, you improve. And Alessandro Schöpf hit those set-pieces perfectly." The 23-year-old wide player arrived at Schalke a year earlier - also from Nürnberg - and has become an integral part of the squad this season, making 28 league appearances. Though his last one came as a surprise. "I actually didn't know I'd be playing until the coach put up the team sheet," Schöpf recalled, whose goal and two assists made him a candidate for Matchday 31's Player of the Week award. If that kind of success continues, says Schöpf, there's no reason a season many had written off can't turn into a success: "We're going to do everything in our power over these last three games to reach Europe." The recent performances of Schöpf and Burgstaller suggest that achieving that target is a more-than-realistic possibility.